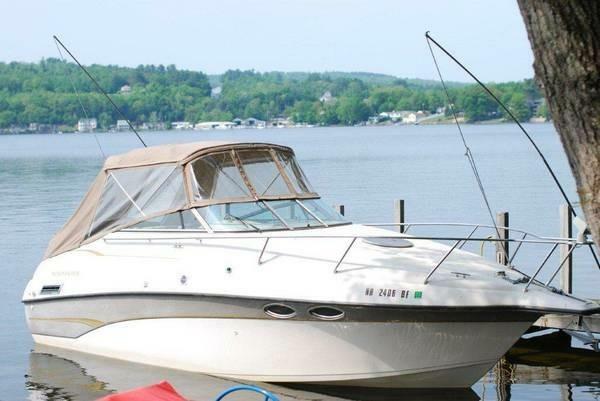 Seller says boat is in very good mechanical condition. Totally seaworthy. Seller just serviced outdrive and says that she runs smooth! With that in mind, boat should be in GREAT mechanical condition. She has always been maintained and serviced. Owner does not use her much, due to a change in lifestyle. She is just sitting on her trailer currently. Because of this, she could use a good thorough cleaning.. Seats will need to be reupholstered.. Carpets could use a thorough cleaning as well. All in all this is a GREAT boat. You can get a premier, high class boat with a lot of power and space without the high price tag. Stock #052134 Power, Lots of Space, at an Affordable Price! 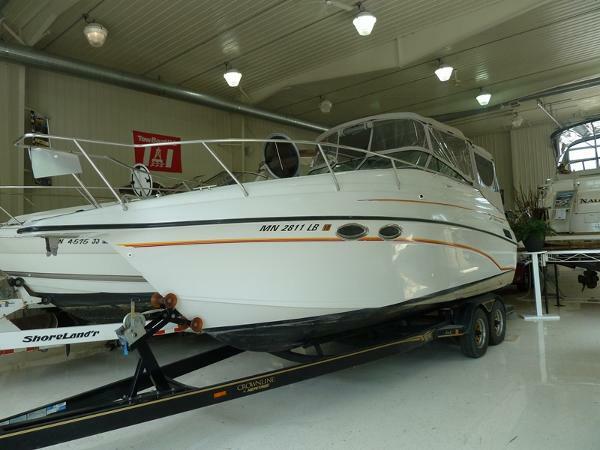 If you are in the market for a cuddy cabin, look no further than this 1999 Crownline 268CR, just reduced to $13,500 (offers encouraged). 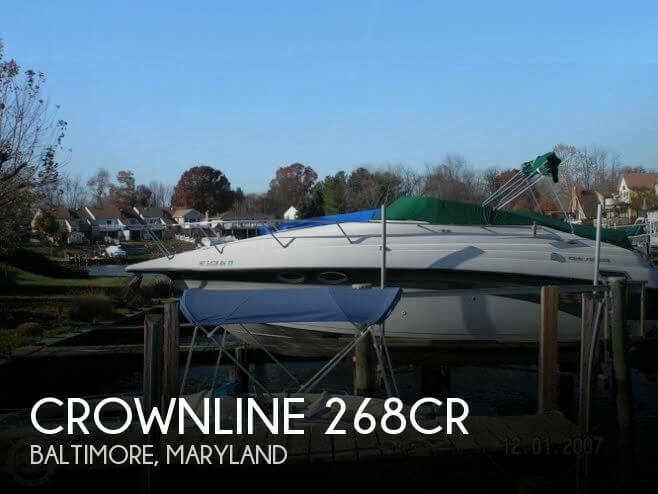 This boat is located in Baltimore, Maryland and is in decent condition. She is also equipped with a Volvo Penta engine that has 300 hours. 2000 Crownline 268 CR W/VOLVO 5.7 GD DUO PROP /BIMINI-FULL ENCLOSURE CANVAS / AIR DOCK & TRAILER*** Crownline offers a beautiful boat with a fit and finish that highlights the quality that sets them apart from the rest. This mid size cruiser offers all the dockside and shore power amenities for a fun weekend on the water, whether your are cruising or taking a weekend trip or just hanging out dockside! This boat is powered by the Volvo 5.7 GS MPI with the Volvo Duo Prop outdrive Only 170 hours on the engine!. The canvas is complete with a bimini top, side curtains, and windshield visor. This boat and comes with a heavy duty tandem axle galvanized trailer and Air Dock for your slip. The cabin is equipped with all the goodies for weekending, like sink, stove, fridge and a microwave oven, and for inland waterway or lake use it has an on board grey water tank. It comes with a fully enclosed head with a hot and cold shower and a marine toilet.The cabin will sleep 4 people comfortably! The cockpit has plenty of room for entertaining your guests and features a very comfortable seating layout. The dash panel is configured nicely for ease of use and has a full compliment of gauges to keep an eye on all your engine functions in dash depth finder,trim tabs and an AM/FM CD Stereo.. At the stern there's a swim platform with boarding ladder.All in all, this boat has everything you could want in a trailerable cruiser. This boat is in stock now at our location and can be seen! Call today to find out more about this boat! 2000 Crownline 268 CR The trailerable Crownline is powered by Merc 7.4L 330HP MPI Bravo 3. Sitting on a Prestige trailer with surge brakes. The mid cabin interior includes a dinette/V berth forward, galley, enclosed head with shower, and four opening ports. On deck there is seating for 6 adults with a walk thru windshield with molded steps provides easy access to the bow. The helm seat also flips up. 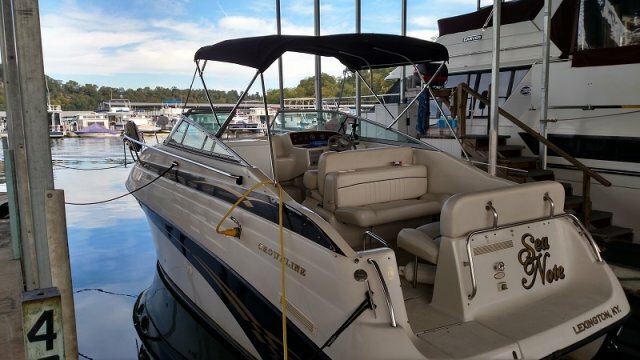 Additional features include a molded bow pulpit, recessed anchor locker, windshield vents, tilt steering, transom gate and recessed swim ladder. 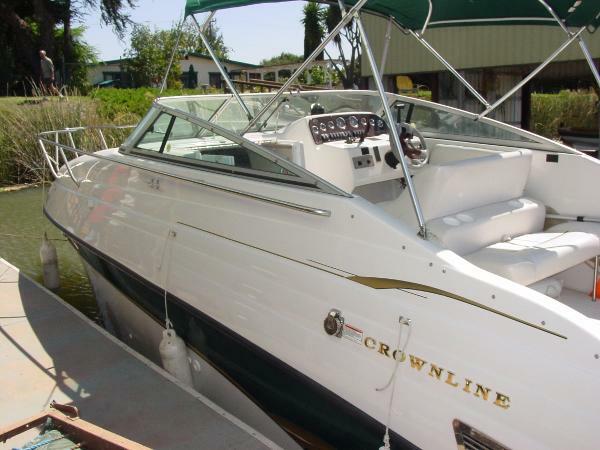 1999 Crownline 268 CR This 1999 Crownline 268 CR offers a lot for the asking price. 7.4L Bravo III with only 364 hours, complete canvas enclosure, sleeping for 4 and an enclosed head. 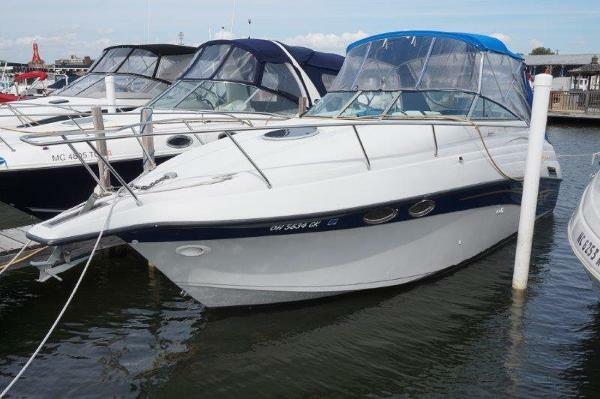 The owner's just aren't using the boat anymore so this is your opportunity to get on the water with little investment. 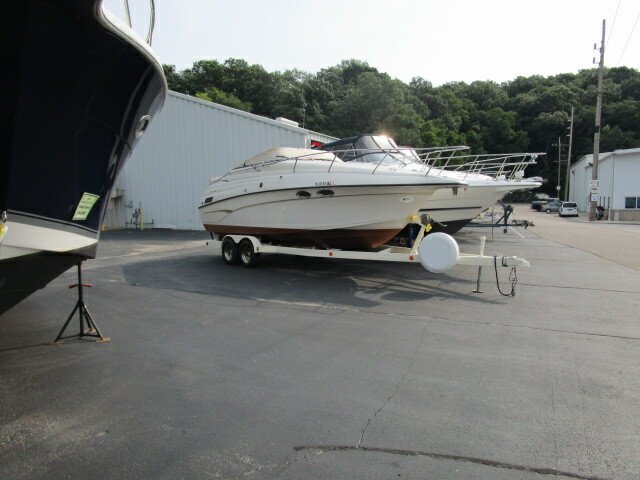 1999 Crownline 268 CR, MerCruiser 454 FI 310HP with 315 hours. Depth sounder, GPS, VHF radio, horn, trim tabs, stereo, CD changer. Hot/cold water pressure, dockside pressure, refrigerator, stove, microwave. Anchor, Air. Boat & engine manuals, Swim platform, bottom paint. Bimini top, side & aft curtains, camper top, cockpit cover. Head system, hold/vac, shower. Converter, shore power, generator, battery switch, windshield wipers, 110V power cord. New in 2013: 2 coats bottom paint, 2 coats trailer paint, 2 new batteries, sink faucets, water pump, spare tire and cover, life jackets, anchor, dock lines, dock fenders, winch straps, power cord 30 amp end.